“The UGRAD Team at World Learning is grateful for all of the people who make this Program possible - the U.S. Department of State, U.S. Embassies and Fulbright Commissions around the world, partners at our 77 host institutions across the United States, and most importantly the Global UGRAD students themselves. We feel fortunate to get to work with such a diverse group of young leaders. This Program helps them reach their potential. 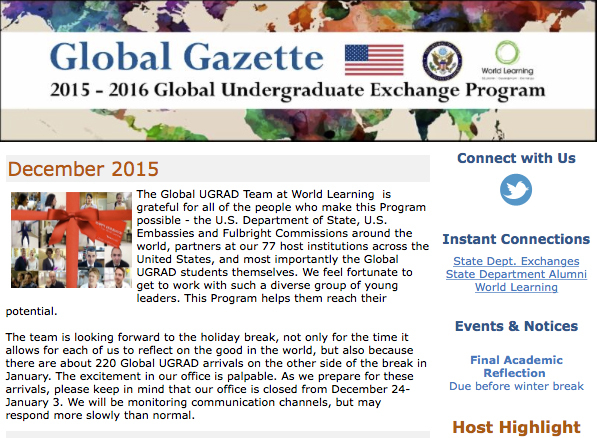 View the Global UGRAD December 2015 newsletter in its entirety.